For obvious reasons, travelling off season brings you many benefits. Not only the destination is less crowded and cheaper but also it offers you unpredicted weather conditions which make the journey adventurous. 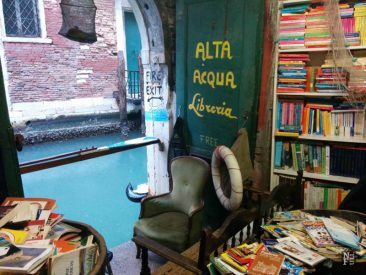 I personally prefer off season travels but sometimes, out of a variety of reasons, we are forced to make choices and this time I just had to be in Italy on a particular day at the precise time. 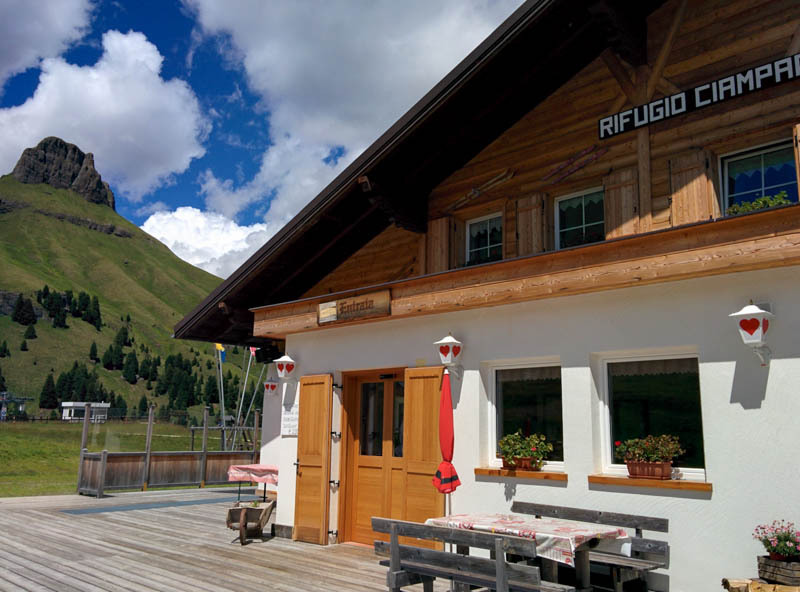 As a result, a short holiday in the Dolomites happened in the middle of peak season. 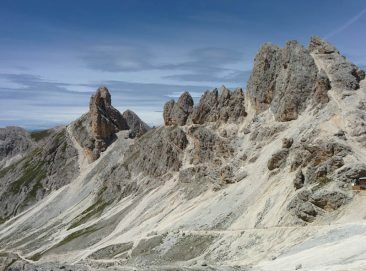 Here is a story how I survived peak season in the Dolomites. I spent three days on the dirt path in the high parts of the mountains and brought you marvellous photos from this wonderful UNESCO World Heritage Site. 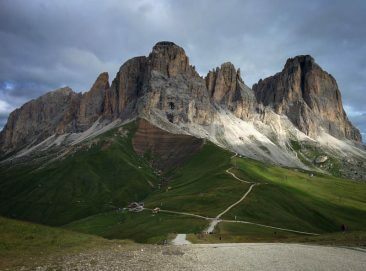 At the beginning of my holiday planning, I was determined to stay only in the mountain huts along the so called Via Alta delle Dolomiti which is a multi-day trekking across the Dolomites. I phoned to a few of the mountain shelters to book my stay only to discover they were all fully booked. 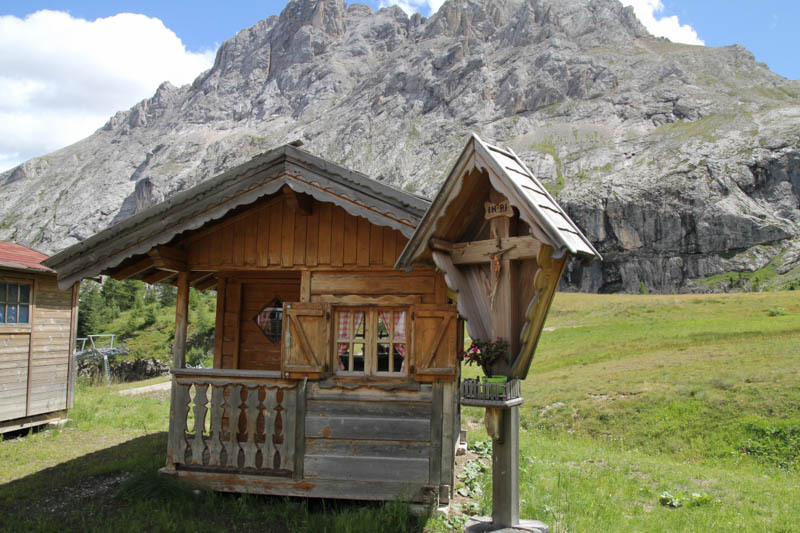 Naturally, each mountain hut will accept guests even if they give you only a mattress and a small piece of the floor but you still need to pay for this doubtful ‘comfort’. The vision of a lonely mattress at the end of the long corridor sounded less exciting than I expected so I thought that I should rethink my holiday plan. Flexibility is good. 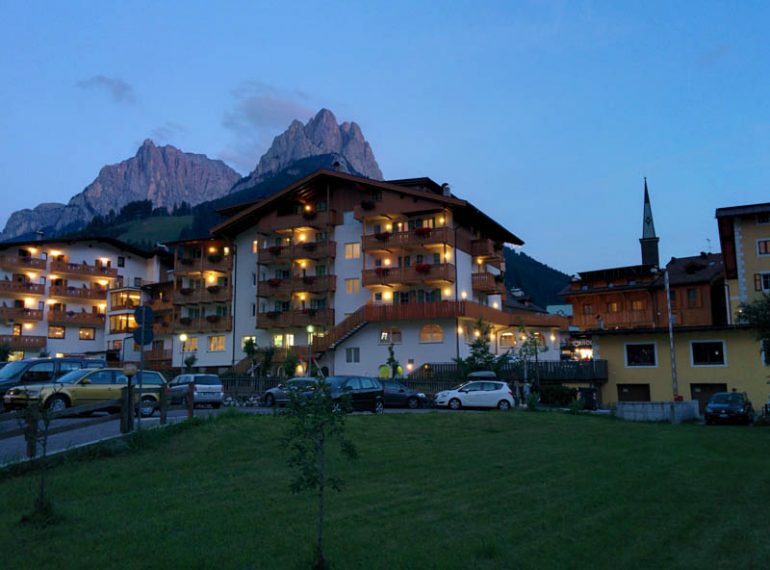 Fortunately, my husband had a similar impression and together we decided to find an accommodation in one of the villages in Val di Fassa. 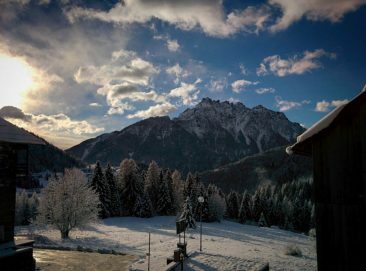 This time it was Campitello and a wonderful Chalet Marcora, a family run small and comfortable place. A beautiful interior design, high-quality abundant breakfasts and friendly staff made our stay pleasant. From Campitello we had all trekking paths at our fingertips. We started our first day in nature quite early. It was wonderfully chilly with a temperature of 12C. A glorious sunny day made our wake up an easy task. We left our chalet at 8:15 a.m. and followed the path along the stream towards Fontanazzo. From a crossroads near the wooden bridge, we climbed up to enjoy spectacular views after 1h 30min. 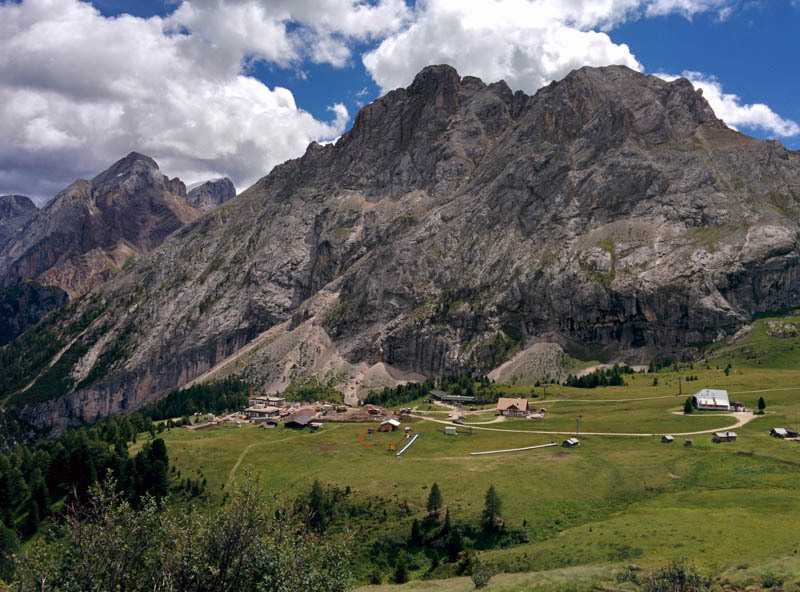 The view opened up and we admired Catinaccio massif, Sasso Piatto and Sella Group. We saw them all at the same time which was thrilling. 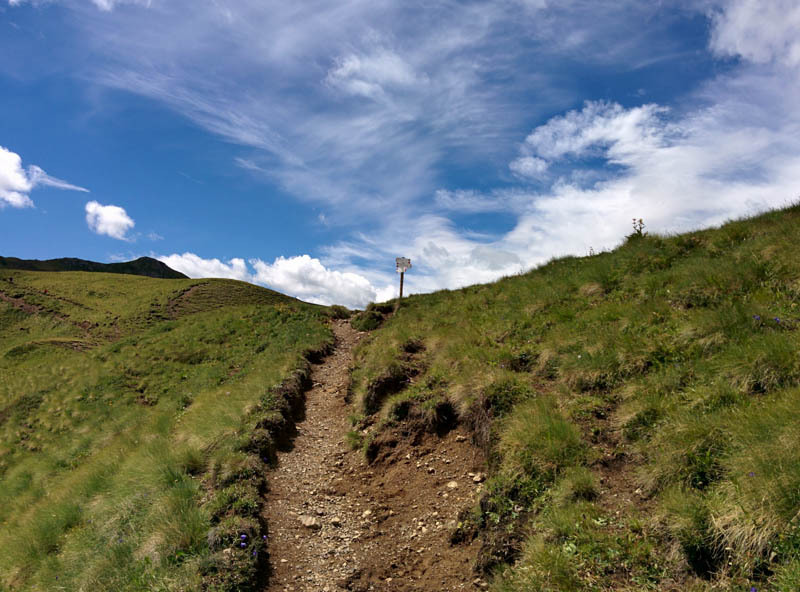 The path followed up, crossed green meadows of the Val de Crepa full of happy cows and brought us up to the pass Pian de Selle at the level of 2185 masl. We had our first break at the pass, looking at the majestic mountain chains in front of our eyes. From the pass, we also saw our target: Rifugio Ciampac located on the magnificent background of high peak Sas de Roca (2618 masl). We went down to the chalet and we had a lovely lunch there in a jolly company of construction workers who were renovating the other two huts: Baita Valeruz and Tobia del Jagher. The owner was charming and the food was great. Out of the window, we could the the Sella Group which was lovely. After lunch, we followed the steep road towards Canazei which in winter transforms into a ski slope. It is so steep that only expert skiers can ski there and watching in the middle of the summer convinced me about it. We continued the downhill trek passing huge lorries that were carrying up construction materials which was a downside of this part of our trek. All in all, we came back to our accommodation happy and tired. 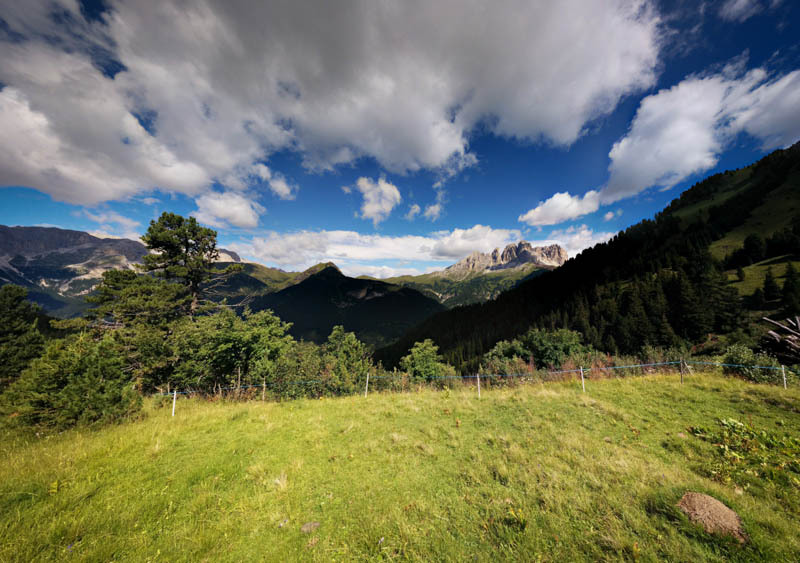 TRAVEL TIP: the paths located far from cable railway and funiculars are always less crowded even in peak seasons. The itinerary of day 1: Campitello – Fontanazzo 1395 masl – Val de Crepa – Pian de Selle 2185 masl – Rifugio Ciampac 2170 masl – Canazei – Campitello. 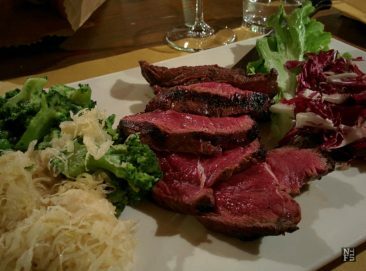 Read about day 2: Sasso Piatto. Read aboud day 3: Antermoia.